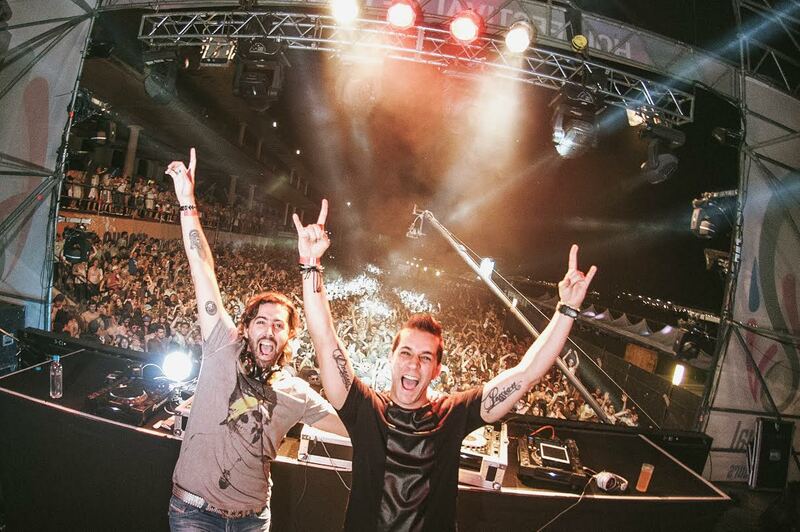 In an EDM Assassin exclusive, we have the South American duo HIIO on tap for an interview. After a hugely successful 2015 in which they played the inaugural TomorrowLand Brasil, the duo have plenty in story for us as the year quickly comes to an end. Check out their responses below! You just released your new single Vortex on Chuckie’s Dirty Dutch Music. Tell us about it? Vortex is a track we’ve been making for Chuckie’s Dirty Dutch label. It really has that Dirty Dutch sound to it. We’re really excited for this one, and to drop it at our shows and festivals. My biggest question, what is it like working together and being from two distinctly different countries? We work really well together. We’re like brothers, and have the same work ethic. We actually both live in Buenos Aires now, Ortzy made the move from Colombia so we could be a duo and work in person, rather that long distance. How did you meet and decide to form HIIO? We actually met through a mutual friend when Nico was visiting Colombia where Ortzy was still living. We then decided to make our first track together – Something About You Feat. Terri B!. After this, we decided to become a duo, and Ortzy made the move to Buenos Aires, and HIIO was born. The collaborative process is difficult enough, what is the biggest challenge you two still face despite seeing success? Sometimes you can work for hours on a track but still not be happy with one thing here or there, but you just have to give yourself a break from what you’re doing, and then come back to it later with a fresh mind to get it just how you want it. What did it mean to you guys to be playing the inaugural TomorrowLand Brasil? Playing Tomorrowland Brasil was something special for us, since it’s so close to home. We’ve played Tomorrowland Belgium twice now, so it was nice to represent Argentina. It was a crazy crowd in Brasil! How was it compared to the international festivals you’ve played previously? The people at Tomorrowland Brasil have an energy you won’t see anywhere else. They’re dancing non-stop, and truly love the music. Who would you consider one of your biggest influences? Do you have any pre-show rituals or superstitions that you follow? Nico always likes to sleep before a show. What’s it like being supported by so many great artists and being well known in South America? It’s really a great feeling to know our work is being respected and supported by industry leaders. We have an amazing fan base in South America, and we love our fans for the support. What is your favorite thing about playing outside of South America? Getting to experience new cultures, meeting new people and playing new venues and festivals. Also being able to meet other artists we work with over email finally in person! When you aren’t in the studio, what do you guys do for fun? We love soccer, spending time with friends, and relaxing. Do you have any advice for up and coming producers? Find your own sound, and believe in it! Make sure to keep an eye out for some new music we have coming out. For now, check out our new track Vortex on Dirty Dutch Music! Good vibes and house music to everyone! We want to thank HIIO for their awesome responses as we head towards the end of festival season. Keep an eye out for new music from the South American duo and if you can, check them out on any and every lineup you see them on! Don’t forget to listen to their newest single “Vortex” above!